LET us enter into the Heart of the Son of God and consider how it is disposed as regards His enemies. Consider its meekness and humility. Nothing that He endures from His persecutors prevents His doing justice ---- to say the least ---- to them; He recognizes that they are acting in extreme ignorance; and, though in truth envy, human respect, self-interest, hatred, pride, injustice mingle in the motives that urge them on, still the kindliness of His heart causes Him to dwell on everything that diminishes the gravity of their sin rather than on what may render them more guilty. How often have we occasion to behave in the same manner towards those who offend or injure us! We ought to see how much more of thoughtlessness, of ignorance, than of malice there is in the conduct that annoys us; we ought to make allowances in some for a naturally hasty disposition, in others for the annoyances and embitterments they have themselves to endure, in others, for mistakes and various natural defects. But alas, instead of thus excusing our neighbor, we do the contrary; we exaggerate small matters into crimes and gross injustices. We make much of injuries which, if it were the case of some other person, we should treat as nothing. When there are many grounds for justifying, or at least excusing, the words or deeds of our neighbor, we seek out the least favorable interpretation and prefer to dwell on that. We are gratified by the misfortunes of those whom we regard as our persecutors; we view with regret their success and prosperity. What weakness of soul all this shows! What reason to feel ashamed of ourselves when we give way to such unworthy and miserable thoughts and actions. Is not this to behave like unreasoning animals? Truly, my God, if Thou wert to judge us in such a spirit, we should be lost. But, as for our Divine Lord, not only is He just to all those who are unjust or cruel to Him, but He regards them with a profound pity; He deplores their blindness and the evils they are bringing on themselves; He laments with tears: "Oh, that thou hadst known the things that are for thy peace! ---- but now they all are hidden from thee." He asks them to weep over their own misfortunes rather than His: "Weep not for me, but for yourselves and your children." He prays for His enemies, suffers for them, offers His Blood to save them; and His prayer and sacrifice bear fruit. For amongst those who were converted by the first preaching of the Apostles were those guilty ones. "This man", said St. Peter in his sermon on the day of Pentecost, "you have crucified and slain by the hands of sinners. You have rejected the just and holy one; you have asked that a murderer should be given over to you; but the Author of life you have slain." "And that day there were added to the Church three thousand souls." How happy for us if we could thus save our enemies by our prayers; what a triumph in Heaven for us, what everlasting gratitude on their part! We can imagine how the blessed spirits feel towards the friends whose prayers and zeal will have brought them into Heaven; but how far more intense must be the grateful affection they feel when they know that they owe their eternal bliss to the generous prayers of souls whom they have persecuted! 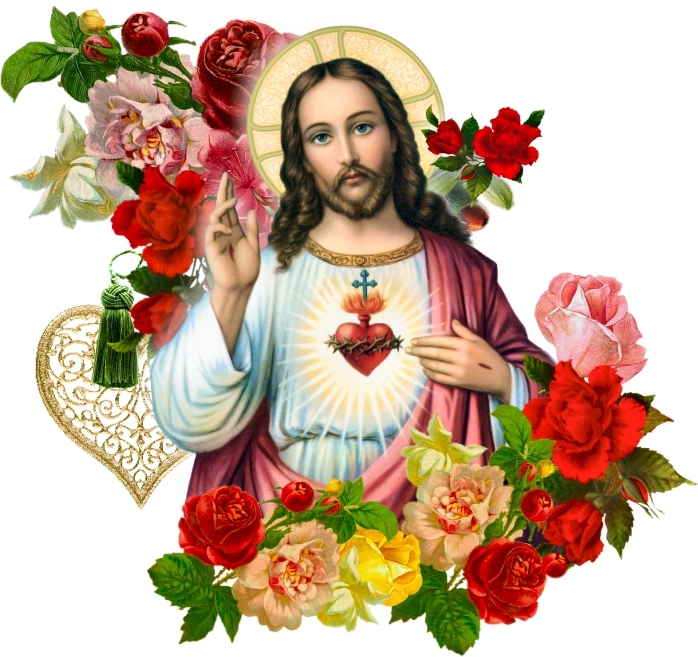 [Such are the lessons given to us by the Sacred Heart of our suffering Lord.] "Learn of Me," He says, "not to create the world, not to bring into being all things visible and invisible, but that I am meek and humble of heart." [So St. Augustine expands for us certain memorable words of the Gospel.] To learn that great lesson let us go to school to that Divine Heart, especially during the holy time of Lent and the Passion; let us strive to enter into It, abide there, study Its movements, and learn to conform the movements of our own hearts to Its example. Yes, Divine Lord, I wish to dwell in Thy heart, and there to lose whatever of gall and bitterness there is in mine; for in the love and sweetness of Thine all that will be quickly consumed. I will study perfect patience in that retreat; there I will exercise myself in silence, resignation to Thy Divine will, and invincible constancy. I will learn how to thank Thee for the crosses Thou sends me, and to ask Thy blessings on any person that annoys or injures me. To acquire Thy spirit of patience and meekness, Thy forgiving love, is not the work of one day; but with Thy help it can be gained at last. Thou didst pray for Thy persecutors. O most loving Jesus; Thou wilt not refuse Thy help to a soul that desires to love Thee; I desire ever to love the cross, to love my enemies, for love of Thee. Amen.